A road in Saltillo froze over and caused the collision of over 40 vehicles in the Nazario Ortiz Garza Boulevard this Tuesday. Temperatures reached 24.8 degrees Fahrenheit, freezing bridges and whole streets over. Around 9:00 PM, police got a call regarding a car crash in Saltillo’s west-side. It would turn out to be the first of many calls, initially reporting 11 cars total slammed into each other. Minutes later, another caller reported a sizeable collision at Nazario Ortiz Garza Boulevard, with at least 40 vehicles involved. Even a police car was part of the crash. Both accidents left noteworthy material damage and more than 20 injured. Fifteen went to hospitals, while the rest decided to remain to keep watch as their cars got removed from the wreckage site. Dense fog and drizzle befell the city, forcing authorities to highlight roadways and close off the Saltillo-Monterrey highway to prevent any more accidents from happening. Thirty-one bridges were closed off, and trash collection services ceased for now. After combined city efforts, the Saltillo-Monterrey highway re-opened this Wednesday afternoon. 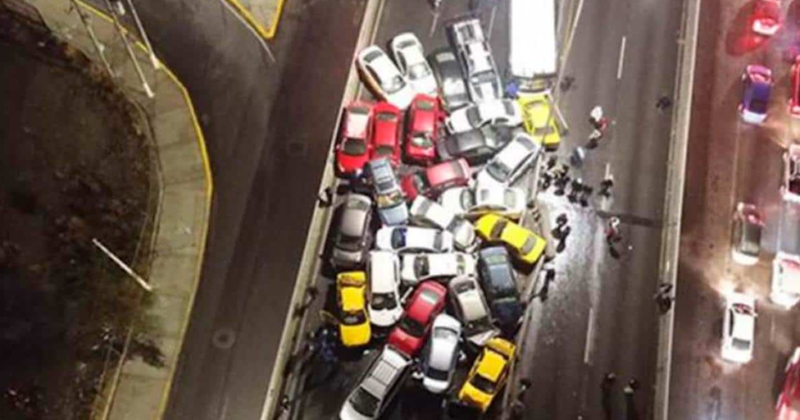 Citizens hope this will be the last car pile-up of this magnitude during the cold weather season.